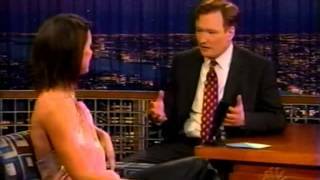 Bridget Moynahan on "Late Night with Conan O'Brien" - 1/29/03. Bridget Moynahan talks about getting married and what her son wants to be when he grows up. Bridget Moynahan on family and "Blue Bloods Cookbook"
I hope you enjoy. Request a celebrity in the comments . Thanks for watching! The Philadelphia Eagles came out victorious against the New England Patriots at Super Bowl 52 in Minneapolis on Sunday.